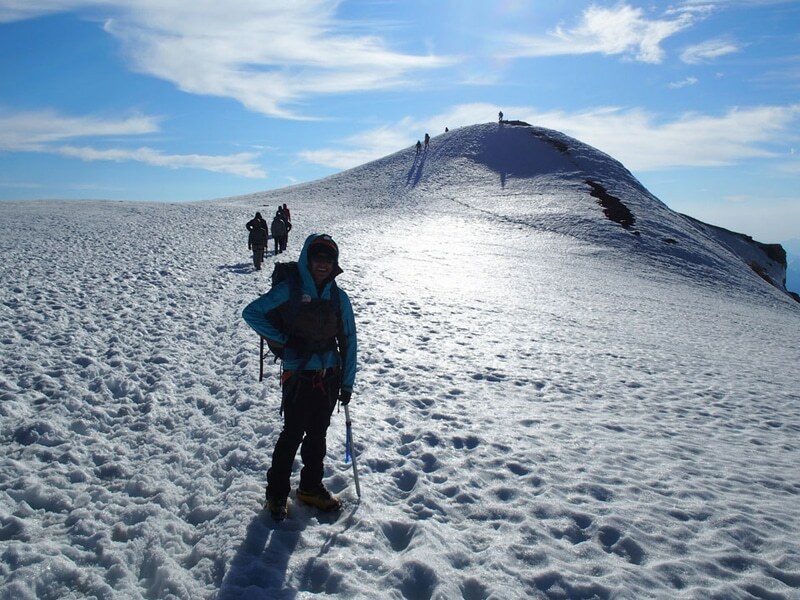 Traversing Mount Baker represents the next challenge for those interested in experiencing the North and South sides of the mountain in a single summit climb. Previous climbing experience and advanced fitness are required for this climb. The traverse includes carrying our climbing packs over the summit of Mount Baker. We approach the North Side of Mount Baker, the North Cascade’s highest volcano, via the Heliotrope Ridge trail. We set camp and overnight at Hogsback (6000 feet) at the toe of the Coleman Glacier. The route ascends moderate glacier until reaching Colfax Col between the Black Buttes and Mount Baker’s Roman Wall. We have the option of setting high camp at Colfax Col or pushing on towards the summit depending on weather and route conditions. After reaching the summit of Mount Baker we descend via the Easton or Squak Glaciers on the South Side of the mountain completing the traverse. We hike to Schriebers meadow and return to Sedro Woolley. Trailhead: Heliotrope Ridge, 3500 ft. Trail synopsis: From the parking area, the well-maintained trail gains elevation quickly, which makes this approach a bit shorter than the southside. After crossing Kulshan Creek at 2 miles (4500 ft.), we break through the trees, crossing another stream at 5400 feet, we climb the final steep moraine we and arrive at the Hogsback Camp between 6000 ft. and 6200 ft. Camp sites are scattered along the edge of the Coleman Glacier, and exact elevation and location will vary depending on water sources and other climbing parties. Enjoy a Northwest Alpine Guides adventure traversing the summit of a classic Pacific Northwest volcano. Climb Mount Baker’s North Side route and descend the South Side of the second most glaciated peak of the Cascade Range. We lead the Mount Baker Traverse at a 2 to 1 climber to guide ratio ensuring that you receive personal attention and hands-on instruction throughout the climb. Plan to arrive the day before the climb begins. Meet in Sedro Woolley, WA. Northwest Alpine Guides will provide you with a detailed PreClimb departure book upon registration including personal gear list, meeting location and driving directions. Our alpine guides will meet you for team introductions, gear check, and group gear distribution. The drive to Heliotrope Ridge trailhead at 3,500 feet takes approximately two hours, reaching the North Side of the mountain. The hike to high camp takes 3 to 4 hours. The team will set camp on the crest of the moraine known as the Hogsback at 6000 feet near the toe of the Coleman Glacier. Depending on conditions, we have the option of ascending to the base of the Black Buttes at 7,000 feet. After breaking camp and packing up, we climb moderate snowfields to the saddle between Colfax Peak between 9000 – 9200 feet. From here, we establish high camp at Colfax Col or if the weather is stable we have the option climbing to Mount Baker’s large summit plateau and descending below Sherman Crater at 9600 feet. Our summit day starts early. From high camp it takes two to three hours to reach the top, the route ascends the final Roman Wall steeply to Mount Baker’s expansive summit. The summit is at the far east-northeast corner. After enjoying summit views from Mount Baker’s highest point and celebrating our success we descend the Easton Glacier on the South Side of the mountain. We hike to Schreibers Meadow trailhead at 3,400 feet completing the traverse. We usually arrive back to the trailhead by mid-afternoon and conclude our adventure in Sedro Woolley. Plan to depart the day after the climb ends. 8:00 am, the morning of the climb, we meet in Sedro Woolley for equipment check before heading to the trailhead. We will email you PreClimb info including gear list and departure details upon registration. $500.00 deposit includes a $200.00 non-refundable registration fee, due with application. Balance due 90 days prior to start date.